The Life Experience Cards are unique to The Brain Architecture Game. One set of cards contains 56 cards. There are 7 cards for years 1-8. 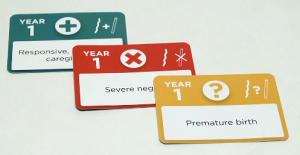 The cards contain experiences that result in toxic, tolerable, and positive stress, which correspond to weak or strong building materials according to the Game Rule Book. Use the link below to buy and download a license to print these yourself at home or at a commercial printer. Each group of 4-6 players get one deck of 56 cards. Sort them by year in order 1-8 and shuffle each year or ask the players to shuffle each year. You can separate them with paper clips or stack them and add the Life Experience Cards Dividers in between years. If you use paper clips to hold together each year’s cards, players often put them back together and put them aside as they play. Just remember that every time you set up, you will need to sort the cards by year again and set them up in order 1-8. How do I print these at home? Buy heavyweight paper, such as cardstock or index card weight paper (120lb will be the best). Some printers can also print on glossy heavyweight paper, but this is a more costly option. 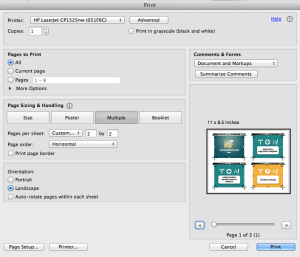 The easiest way to print is to use Acrobat Reader’s print settings (File->Print). 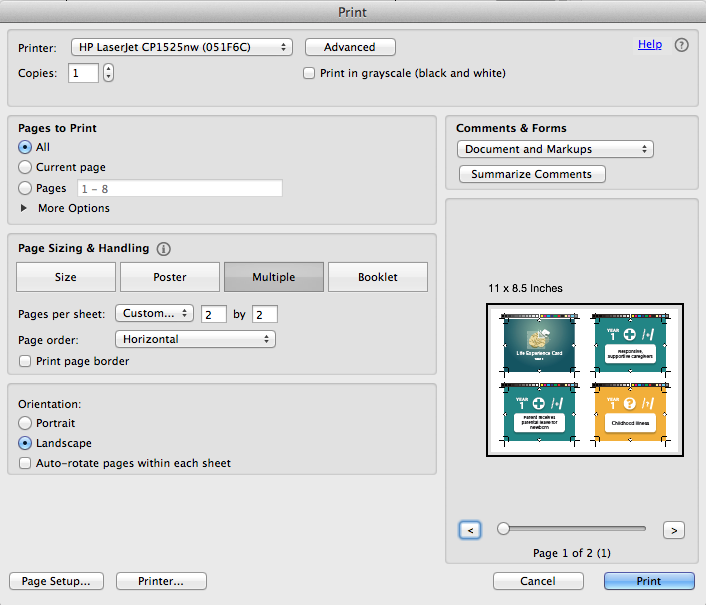 The print dialog box will look like this and will allow you to print multiple cards on one page. Switch to landscape mode to get the cards to be larger and choose 2×2. You will need 16 pieces of heavy paper to make a complete deck with the year dividers. We highly recommend that you print single-sided with the first card in the template as a divider card. Most game moderators use this option and the game is just as effective because there is nothing critical on the other side except branding. Lastly, trim along the inner crop marks of the template. If you haven’t done this before, we recommend using a box cutter with a sharp blade and a ruler. If you do not have one at home, most paper copy stores like Office Depot or Staples have one by their photocopiers. This is not the only way to print the cards but it is the fastest to set up for some people. 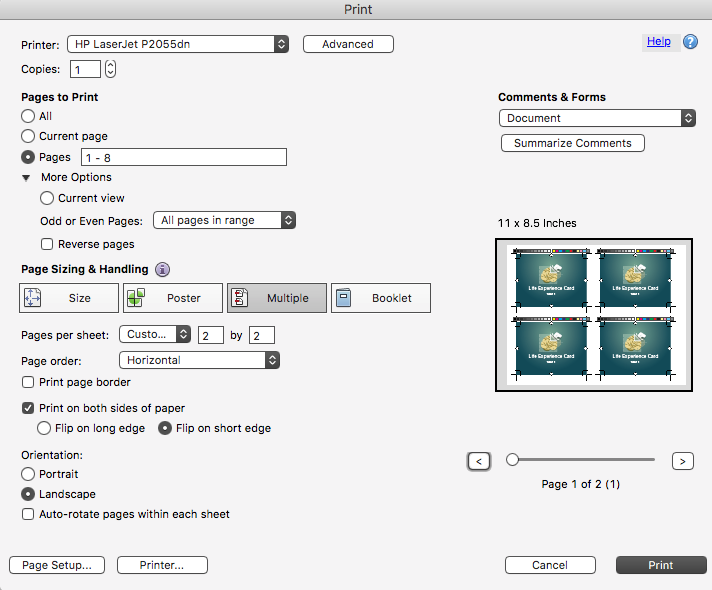 Then to print use these options–especially important if you have a duplexer to print on landscape mode so that the cards will line up properly (click on the image to see it better). 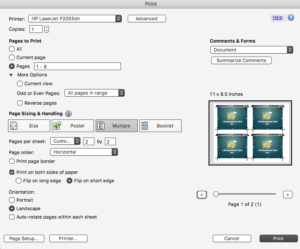 This example is set up to just print pages 1-8 so you have one test page. If it works for you, you can change it to print All pages. 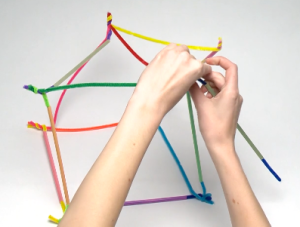 Pipe cleaners are the main building material for the game. You will need up to 30 pipe cleaners per group of 4-6 people. Up to 3 or 4 pipe cleaners are used for the base of the brain and 3 pipe cleaners are used for each year of the Life Experience Cards (3×8=24). 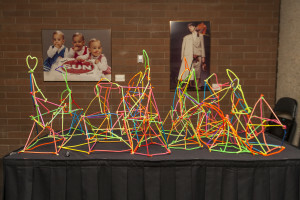 Players might not use all of the pipe cleaners if their structure collapses before year 8. 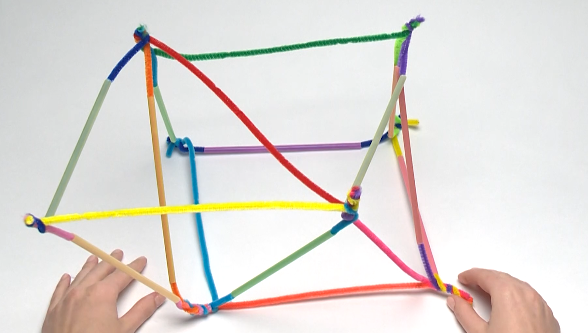 Each group of 4-6 players needs 28 pipe cleaners that are 12 inches long and 6mm thick. They can be any color. Don’t use thinner or shorter pipe cleaners. 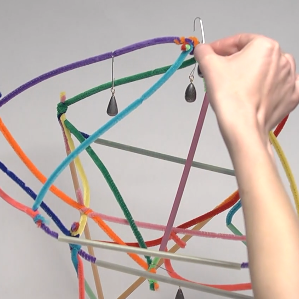 Optionally, use 2 more pipe cleaners to help tie them and the straws neatly together upon setup. You can get pipe cleaners (also known as chenille stems in some parts of the world) at any craft or art supply store. Dollar stores and pharmacies often carry them as well. Don’t buy pipe cleaners thinner than 6mm or shorter than 12 inches. The physics of the game will not properly work with different materials. 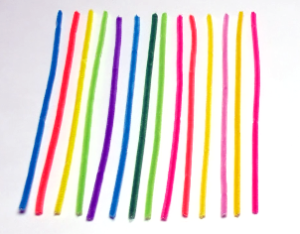 Straws are used to strengthen pipe cleaners as construction material. You will need up to 25 pipe straws for 4-6 people. Up to 3 or 4 straws are used for the base of the brain. Up to 6 are used as social support lottery. 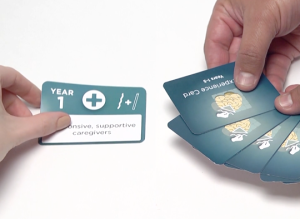 Depending on the Life Experience Cards, players may receive up to 15 more straws between years 1-5 (3 per year). Players might not use all of their extra social support straws earned in the social support lottery. Each group of 4-6 players needs 25 straws. You can use an extra pipe cleaner to tie them together neatly. You can find straws in dollar stores, pharmacies, grocery stores, department stores, restaurant supply and craft stores. 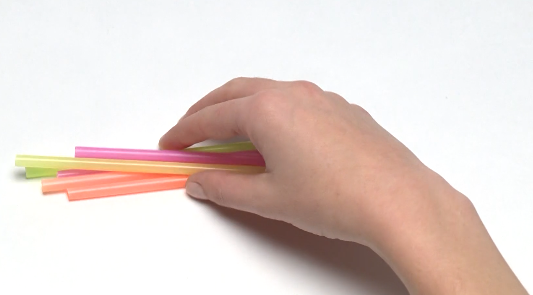 Straws should be between 7.5 and 8.5 inches long and wide enough to fit over the pipe cleaners. Straws need to be long enough to have room for twisting pipe cleaner ends together. They can be any color. Don’t use non-disposable ones or boba-drink (super thick) straws because they are too strong. Bendable on one end is ok too. Weights are hung from the tallest point of the brain structure in years 6-8 when a Life Experience Card results in toxic stress. You will need up to 9 weights per team of 4-6 players. Weights must weigh between 9-11 grams and be hung from something long, e.g., an ornament hook or big paper clip. The structure collapse rate (if you are playing with multiple groups) should be between 30-40%. We recommend one extra weight (total of 10) because weights get easily lost. Place weights on table in a clear plastic bag or velvet drawstring bag. Include enough paper clips or ornament hangers. Remove weights from structures before people run off with them! It depends on what kind of weights you want. 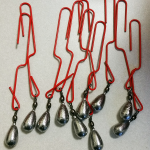 The most convenient ones are copper bells (often available at craft stores) and fishing weights (3/8oz swivel sinkers), either lead or lead-free. 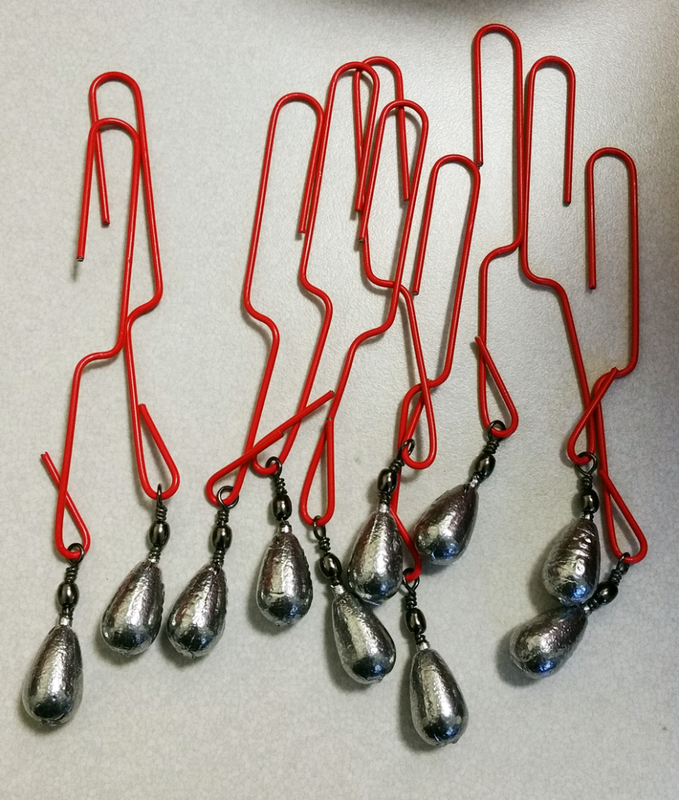 It can be hard to find fishing weights in very large numbers. When we did our prototypes and first test order, we had them custom ordered from a vendor we found on ebay and another vendor in China. A precision scale is recommended if you will make your own. Don’t use materials lighter than 9 grams or heavier than 11 grams. The physics of the game will not properly work with different materials. 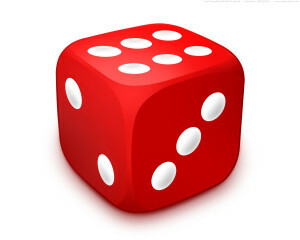 The die is used at the beginning of the game to select the genetic lotery, social support lottery and special occasions related to tolerable stress Life Experience Cards. You will need one six-sided die. Any size or color will do, but we recommend at least 12mm so you don’t lose them and they are easy to read. No special setup required. You may want to place them in the same bag as the weights. You can find dice at any craft, art supply, and toy supply stores. Dollar stores, big chain stores, and pharmacies usually carry them as well. The Life Journal is used to keep track of various aspects of the game, including the Life Experience Cards and the accumulation of stress. Include one sheet for each group of 4-6 players and ask one person to be in charge of it. We recommend that you provide a pen or pencil to each group. Print some extras to have just in case. Encourage people to take pictures of their Life Journal along with their structure to post on our Facebook page. For the purpose of evaluation of the game session, keep a photo record of all Life Journals and each structure that went along with it. 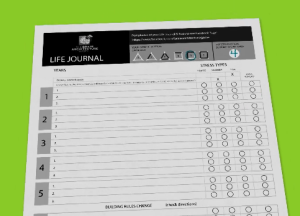 You can download and print Life Journal PDF format templates from our Required Materials section or by clicking on the link below. Letter size (8.5×11 inches); grayscale. 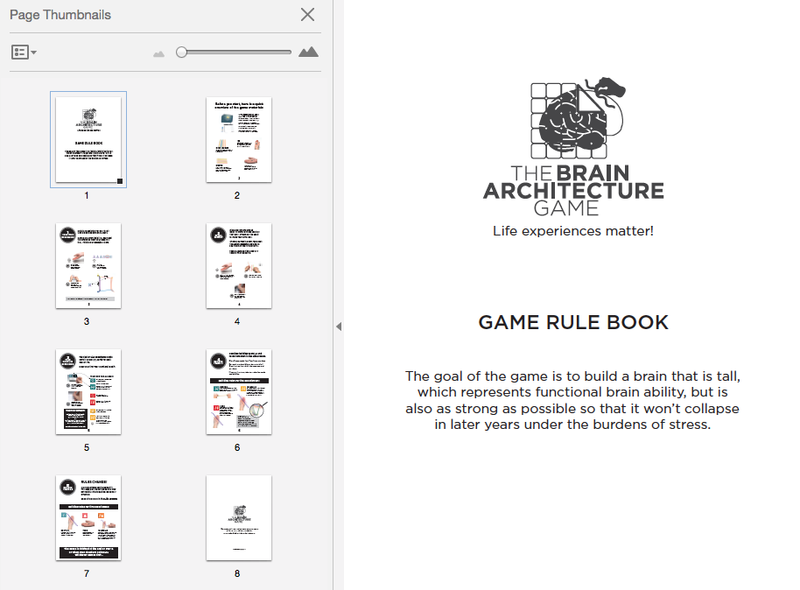 The Game Rule Book is your complete step-by-step guide to the game designed for game players. Include one Game Rule Book for each group of 4-6 players and ask one person to be in charge of it. Print some extras to have just in case. Collect Game Rule Books for re-use. You can download and print Game Rule Book PDF format templates from our Required Materials section or by clicking on the link below. Letter size (8 pages, 8.5×11 inches). Print color or grayscale, single-sided or double-sided. We have used these recommended materials in the past with good results in the lab. We recommend them without benefit or liability for the products listed. These are well-priced and they are the right size and weight. We found these to be smooth, with a nice weight/feeling to them, which makes them very reusable and they are comfortable to hold without getting paper cuts due to their thickness. TIP: If you are re-using the cards a lot, it is worth laminating them. Metal book binder clips with a paper clip as a hook. 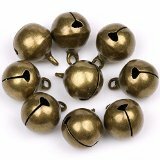 Copper bells from craft store or online store.